Pantai Bisikan Bayu, or the Beach of Whispering Breeze, is a pleasant beach fringed with casuarinas trees and coconut palms. It is located between the villages of Kampung Tok Bali and Kampung Semerak on a stretch of Kelantan coastline just before the border with Terengganu. The beach is also known as Pantai Dalam Rhu. With a lagoon behind the beach and the South China Sea in front, it is a peaceful spot. The Perhentian Islands can be seen about 25km away in the distance. I visited the beach in March 2012. It did not seem to be affected by beach erosion, unlike those Kelantan beaches further north. The sand was nice and soft. The sea water was clean and soft underfoot but a slightly brown colour caused by the churned up sand. There were no rocks under the sea. There was quite a lot of rubbish on the beach. A road runs alongside the beach and vendors were selling BBQ grilled sweet corn and coconuts. The location is marked on the interactive map on the Top Kelantan Attractions page.Stay on the beach road (D11) from Bachok towards Terengganu. You will see the turn off signposted near the town of Cherang Ruku. 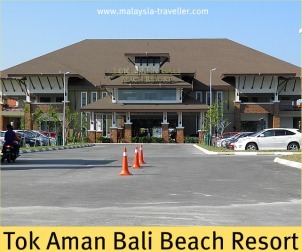 A new hotel was opened here in November 2011 called the Tok Aman Bali Beach Resort. I believe it is a 4 star property. It is built on a boat shaped island surrounded by lagoon. There are paddle boats available for going round the lagoon. It looks neat, clean and modern with a large swimming pool and beachfront access. For other Beaches & Islands click here.